Does your little girl have the attitude of a high-end fashion model, a little sassy as well as a bit on the bossy side? Is her favorite hobby shopping? If she had to choose one color to wear for the rest of her life, would it be pink? If you answered yes to any of these questions then we have the perfect costume for your little girl! Check out this amazing Shopkins Lippy Lip Costume. It will be perfect for your kiddo to transform into her favorite member of team Health and Beauty. Lippy Lip is one of the rarest of Shopkins in season one and now, your youngster can be a rare sight of beauty this Halloween. Normally, kids like to dress up as dreadful creatures such as vampires, werewolves, and zombies. Your little girl, however, will be the most charming, walking-talking cosmetic product. A stylish sleeveless dress starts this beautified transformation. The dress has a satin bodice with Lippy Lips’ face printed on it with her classic winky face. There are also ribbon bows on the shoulder straps of the dress. The skirt has a glittery knit mesh overlay that will bounce to and fro as your kiddo skips down the block to collect plenty of sweet treats. Finally to top off this lovely new look add the lipstick headband atop your little girl and she’ll be ready to go! 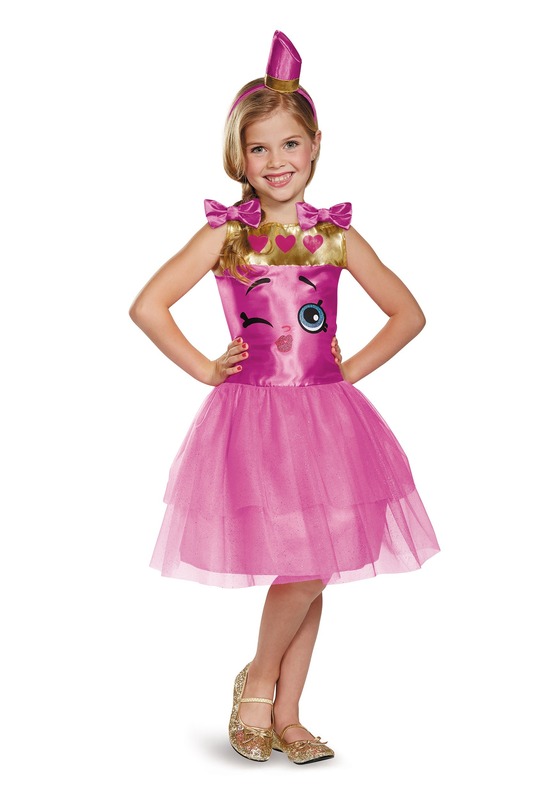 Grab this officially licensed Shopkins Lippy Lips Costume and your little girl can start telling everyone to “Have a beautiful day!” She’ll be sure to leave her mark wherever she goes this Halloween.